Mash cilantro, green onions, jalapeño pepper and kosher salt in a mortar and pestle. Add lime juice. Mix well. 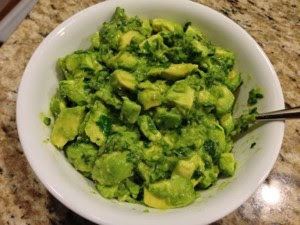 Fold in diced avocados to keep the guacamole chunky. Serve with nachos or tortilla chips immediately. Store any leftovers in an airtight container. to help keep guacamole from turning brown, oil one side of a Saran Wrap and place directly on the surface of the guacamole. The oil will help keep oxygen out, which is what makes the avocado turn brown.